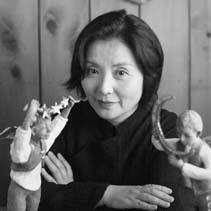 Born 1943 in Tokyo, Japan. Spent her childhood living abroad with her father, a diplomat, and her mother, a painter. 1956-1960 Studied ballet at The Royal Ballet School, London, UK. 1968-1969 As a Fulbright scholar, studied at Stella Adler Studio of Acting, New York, USA. Since then has had a wide career as an actress in films, television, and on stage. “VIVA Circus”, published by Sankaido, 1988. “Carnival”, published by Yobisha, 1989. “DREAM”, published by Shinshindo, 1993. “Clowns”, published by Wani Books, 1995. “Kenji World”, published by Heibonsha, 1996. “VISIT- Stories of Sky&Sea”, published by Switch Publishing, 1998.